Performers include: Nicholas D’Agosto, John Lithgow, Jayma Mays, Sherri Shepherd, Steven Boyer, and Krysta Rodriguez. 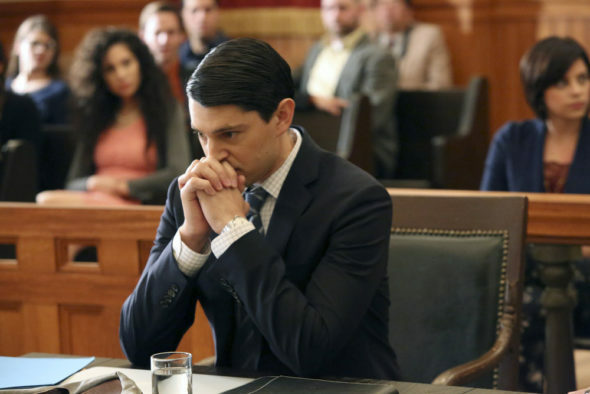 A scripted comedy series, the Trial & Error TV show centers on young, bright-eyed lawyer Josh Segal (Nicholas D’Agosto). For his first case, New Yorker Josh heads off to East Peck, a tiny Southern town. Eccentric, “rollercizing” poetry professor Larry Henderson (John Lithgow) has been accused of murdering his wife, in quite a bizarre way. Now, Josh has to defend him. Josh sets up shop in a makeshift office, behind a taxidermy business. Once there, he and his quirky team of local misfits gets to work. Summer Henderson (Krysta Rodriguez) is Larry’s adopted daughter. She comes to East Peck to support her father throughout his trial. Former cop Dwayne Reed (Steven Boyer), is the defense team’s lead investigator. Rounding out the group are Carol Anne Keane (Jayma Mays) and Anne Flatch (Sherri Shepherd). What do you think? Do you like the Trial & Error TV series? Do you think it should have been cancelled or renewed for a third season? I loved this show. So different from any other comedy. Quirky characters who are likeable and very, very funny. So well written! Netflix, please pick this up. It was a really good show. It was the best TV show on NBC-Netflix should take over the series. This would be such a shame to cancel this show. Finally something that is absolutely hilarious and brilliant on TV. And I live in SC! Love, love, love the show!! Hilariously funny. Simple fun. Sure hope it’s renewed for a third season. One of the funniest shows out there. Please renew!!! Please renew! This show is the funniest thing on tv. Love! Love! Love this show! Laugh out loud funny!! I look forward to this show every week! Please don’t even think of canceling this show! Great comic relief!! My husband and I love watching Trial and Error. It’s the only show we wait for all week… We tell everyone to watch it. So much better than all the depressing violence all over TV. Nowadays, more than ever, we need something funny and light-hearted to enjoy! We loved John Lithgow, and thought Kristen Chenoweth was amazing… The regular characters are sooooooo funny. Hard to believe NBC is considering cancelling!!! I love this show. It is so different from all other shows. Fun & relaxing to watch.